Arguably, this is Edge's 'greatest delay song' because the delay is so clear and audible and yet it can't easily be separated from the guitar signal, they are so well woven together. In almost every other song where a long delay is used, a casual listener can probably tell that some kind of delay is being used ('Streets', for instance). In 'Bad', for the most part, you would probably never know that half of the guitar notes you hear are from the delay. Anyone who claims that Edge is not a 'great' guitar player, should try playing the main riff to this song with the right delay. Your timing has to be perfect or it sounds awful. The main riff is something of 'tongue twister' to play with the delay if you're not used to it. It's important to keep the low notes palm-muted and to hit them on every beat to help keep time. The high notes should ring out. Edge picks all of the notes as downstrokes except the high notes. Play all of the notes in even time! (The delay adds the rhythmic element of the song and its 2 or 3 riffs). 1  2  3  4  5  6 7   8        1  2  3  4  5  6   7  8    ..
1  &  2  &  3  &  4  &  5  &  6  &  7  &  8  & -  1  2 ..
And the delay fills in the rest. Starting at time 0.00 at the beginning of the CD track, the sample runs from [2.2 - 3.5 secs]. In the sample you hear the first high 'E' note (12th fret, E string) Edge plays in the song. There's clearly a mic bleed (~5ms, 1-2 repeats) surrounding the attack (see the main page for more info). Then there's a slight delay at 220ms (approx 3/32 @ 95 bpm) with no echo around it. Then there's the main delay that you hear in the song, at about the same volume as the initial attack, with the same room echo as the initial attack. At Live Aid, they played the song at 102 bpm. Edge's main delay was set to 440 ms (exactly 3/16 @ 102). There was also a secondary delay, as in the album version, at 330 ms. Note: It's important to have exactly 1 delay repeat on the input signal and no faint further repeats. again, that rhythm is lost and the overall sound becomes flat. hear it in the album or live recordings. HI there, well, i completely checked out you heavy work here. Really Amazing what you`ve done. But i must admit, sorry, that i can`t hear anything in the soundclips to lead to your conclusions and some U2 riffs you played are not correctly performed. Maybe sometimes it`s better to first learn how to play...I m sorry, but thats the way it is. However your work is really interesting and inspiring. The Edge es un gran profesional y una persona admirable por su incansable auto exigencia, me gustar a sugerirle talvez qure alternara en nuevas canciones instantes sin DELAY, que el sabraaventarlos sabiamente. I can only use two delays,so i deleted the short "5ms" delay and it sounds pretty great to me.Its obvious that the edge uses some hardware to get his "exact sound".If you look behind him he has two fridges full of processors.Great job though i was just listening to bad and it made me think how his sound was created.So i jumped on to the net and found this site first off.I'm pretty impressed as you go into great detail and once i programmed the times into my rocktron chameleon PRESTO! im the edge but with only $200 million less in the bank .Whether this is exactly the right way ,who cares?Its given me something to play with and may be develop my own new sound and thats whats important! keep up nthe good work J.F. I appreciate your work here but the samples say it all - no, no, no. BAD is the best example. A simple dotted 8th modulated delay nails it. Your sample proves the point that you're making a mountain out of a molehill. The Edge is brilliant because he does so much with so little - no need to complicate it, mate! You have done some solid work here. I think that in some instances, a short delay coupled with a long delay may not be the answer to the master's riddle. Bad has alot more actual picking going on than some might realize. If you actually try to pick the part the way it is sounding to you, then add the longer delay I think the results are surprising. The longer delay needs a little more regeneration than 1 repeat, but not much more. I think the key here is the constant rhythmic picking of the "drone" strings (open A & open D) along with the notes at frets 11/12 (C# & D) and frets 7/9 (D & E). I believe Edge does use up and downstrokes (which makes it even trickier to hit both strings evenly and consistently) and the delay fills in the spaces. All you need to do is listen to the begining and you see he IS picking this way. He starts on the open A picking in time 4- 16th notes to the beat (down/up/down/up), then adds to it. The delay fills out the ! part, but he keeps the rhythmic motion not by adding delays, but by returning to pick those open string/fretted note combinations. This is what allows you to have that continuous, almost sustained quality to the part without relying on the delays to do the work for you. Besides, if you used multiple delays or kept the regeneration level greater than 1-2 strong beats, you do not get the same sound. I think The Edge is a greater guitarist than most realize for this fact, his effects color his sound. They contribute to the end product. They do not create it...he does. Thank you for the site, it's good to see people thinking and sharing ideas about music that matters. hey, im not sure if im thinking correctly, but i think some of the "room echo" and "short delay" you speak of may in fact be caused by his amp itself. 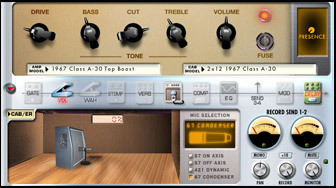 The vox Ac-30 that edge uses so often has a delay knob i believe, or if it isnt a knob then it is just a natural part of the amps sound. but the amp naturally has delay to it, so i think that may account for some of the multidelaying that edge uses. Hey, great work here! I love the attention to detail and all of the time you must have put in analyzing the waveforms, etc. Just a few suggestions/cautions for readers: First, the edge's picking is often more complicated than what's going on in the dry (or non-delayed) parts of the posted samples. Simply put: You can't use more complicated delay settings to compensate for some really nuanced and subtle playing. I don't think the Edge started out with such complicated technology (which is a good thing because if he did, he wouldn't have developed his unique style). Try playing Bad or Streets or whatever WITHOUT delay. When you have something that sounds pretty good and it sounds like you're actually picking some of the delayed notes, then add some delay (for Bad, a simple delay at about 440-460ms with 1 strong feedback at 100 percent volume and another at about 50% volume for instance). Second, play WITH your delay. That is, don't just try to copy the ex! act BPM or delay settings of the song and then play to what you're hearing on CD. Set your delay close to what sounds right, turn off the CD and play what feels right at the tempo that feels right given your delay settings. It doesn't really matter if you're at 440 or 442 or 460ms; you can make BAD sound really good by working with your delay and your own tempo (and you'll probably end up putting a bit of your own style in as well). Third, use compression and know how to use it. This is essential. Fourth, remember that the Edge would be dissapointed in you if all you're trying to do is copy him. I dialed in the Streets settings suggested here, played the intro once, and then spent two hours coming up with my own riffs using that exact setting. Again, thanks for the info! I think your 467ms delay is slighty slow. In my opinion 420ms sounds much closer. I find myself "waiting" for the delay at 467ms. Finally someone has gotten it right. You have to play so little to make Bad sound like the real thing. It's obvious if you listen to the unique syncopation of the higher echoing notes. Faking it never rings the same. Great job. I figured it out by experimenting hour after hour back in the 80's. It's fun to see your systematic approach. Does anyone have a tab for the short harmonics edge sometimes plays at the very start of bad . Its in a similar fashion to the ones he plays at the start of streets sometimes . make it simple 1st delay 430 ms at 100% 1 to 2 repeats the second delay is about 276 ms 50% with 1 to 2 repeats or more all modulated. i added a reverb hall so it sound big and very shimmering and of course used dunlop or any gritted back picks to sound like edge. Really, the song is a round -- like "Row Row Row Your Boat." The delay lets one musician effectively start the round at multiple times, and the song harmonizes with itself like rounds do. Of course, the notes are pleasant and bright as well. But that's probably where the inspiration came from. This is not too accurate, even though most of your other work was and I really respect what you've done here. I find this song is good to play with the settings of "Where The Streets Have No Name". Well, there is definitely none of the choppy delay that you included here, and you only play the diads once as quarter notes. The 2 repeats are done by the delays. It really sounds much more accurate. Your website is fantastic. Can't thank you enough for the education. I'm 35, and 2 years into playing guitar. Much of what you have is still over my head, however I have a question for you. Have you seen "It Might Get Loud?" Specifically, one of the extra scenes where Edge is sound-checking? He goes through a few classic Edge tunes, one of them being "Bad." While I find your settings for "Bad" perfect for playing the original recording of the song, he plays it slightly differently in the live "Wide Awake In America" version and even more so in the scene I mentioned from "...Get Loud." (that latter version is my favourite... more delay and more palm muting it seems like). I use Garage Band on an iMac and more recently I've also started using Amplitube on my iPad. I was wondering if you could help me get the tone and delay i hear him playing in It Might Get Loud? ps: if you haven't seen it yet.... GET IT! !